There is no real translation for the Greek "Opa!". It's kind of a "hurrah" or "bravo". In that case, Opa Opa restaurant is aptly named. Located at 5644 J Street, Opa Opa is casual in setup. It is cafeteria style. After looking at a menu, you go up to the counter and place your order as you grab a tray. 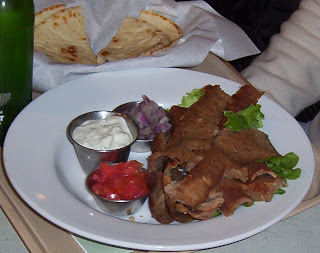 The menu had the full variety of Greek dishes from dolmathes (stuffed grape leaves) to leg of lamb and gyros. Our meetup group went through the line and sat and devoured our food. Dianne and I had the pastitso (pic above)- layers of elbow macaroni, parmesan cheese and a spicy meat filling, all held together by a rich bechamel sauce. 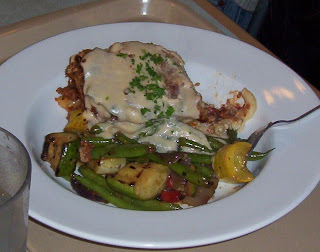 It was served with a side of grilled veggies, that were nicely seasoned and still had a crispness to the green beans. Robert had the seafood souvlaki, basically a shrimp and scallop kabob with rice. 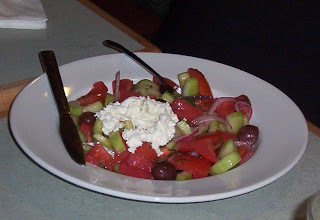 Melodee had a simple tomato, cucumber, feta salad. Kieran had the gyro plate. But even after all that, we weren't done! Phil, the owner, asked if it was our first time there. We all said it was and so he brought us extra food to try! And boy was he generous! He brought out a huge plate of hummus and bread. The hummus was salty, garlicy, and delicious. There was also a small plate with a few slices of lamb and their special mint paste. Phil came out to explain that they go through 100 gallons of hummus a month! He said the hummus, tzatziki, and falafel were all made there. Melodee and I admitted that we really didn't care for falafel. Well that might as well have been a dare to Phil. He then brought a plate of their homemade falafel and explained the best way to eat it - dipped in the tzatziki and then with a bit of hot sauce. I must admit, they were very good. Right next door to Opa Opa is Sweeties - a dessert shop. I am constantly arguing that there need to be more quality dessert places in Sacramento. This is just a shop without tables. There is a counter along the window where you can stand and eat your treats. Pretty much all of the desserts are done in single servings - mini cakes versus getting a slice of cake. 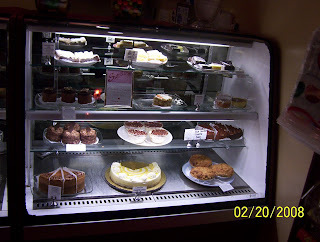 There was tiramisu, cheesecakes, cakes, cupcakes, brulees, etc. I chose the coconut cream cake and enjoyed it. They stay open until 10 for that nightly sweet tooth craving.